Don Engel, UMBC’s assistant vice president for research, has been selected as one of just eight participants nationwide in the new Research Leader Fellows program sponsored by the Council on Research within the Association of Public and Land-grant Universities (APLU). The 18-month program focuses on helping emerging research leaders to develop knowledge and skills in new areas related to supporting university research today and into the future. Participants attend conferences, participate in facilitated meetings as a group, and receive direct mentorship from experienced higher education research leaders. “I think the most valuable thing about this program will be that it will expose me to things that we can do that haven’t been on our horizon, because we haven’t yet thought to look creatively in those directions,” says Engel. In his fellowship proposal, Engel outlined plans for two projects in which he’s already deeply invested. First, Engel is working with the UMBC community to develop makerspaces on campus. While many makerspaces in academic settings create opportunities for students to “learn about tech through tinkering,” Engel says, he would also like to see these spaces “conceived as…tools to advance faculty-led research.” That research could be in any field that “depends on rapid fabrication and prototyping,” such as robotics, or into fabrication techniques themselves, he explains. 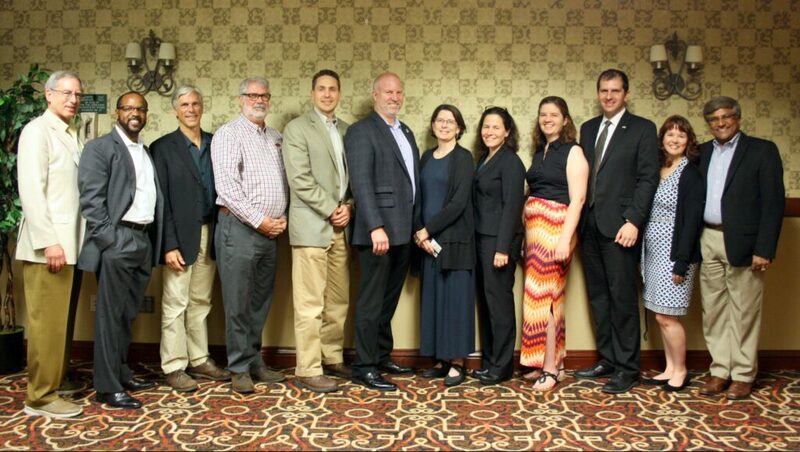 Don Engel (third from right) with the inaugural cohort of APLU Research Leader Fellows. Photo by Sarah Rovito. During the fellowship, Engel will attend the International Symposium of Academic Makerspaces at Case Western Reserve University. Case Western is the site of the world’s largest academic makerspace, and Engel intends to take advantage of the symposium’s location to learn how the university developed and now manages the facility. Engel will also travel to the 2018 World Maker Faire in California. Both trips, along with conversations with other academic institutions that house makerspaces, will inform ideas about best practices for building impactful, sustainable makerspaces at UMBC that serve a wide range of people across the university. Broadly, Engel hopes to gain skills that will serve him and UMBC long into the future. He sees the Research Leader Fellows program as an opportunity to learn more about the expansive, cross-disciplinary areas that research leaders are expected to supervise, from research compliance to extramural partnerships. He also anticipates the program will help him, and his fellow participants, develop skills to facilitate campus-wide conversations on research issues across disciplines. Image: Don Engel speaks at a UMBC research event. Photo by Marlayna Demond ’11 for UMBC.